U.S. new-vehicle sales reached 12.72 million in 2011. Here's how they impacted the average dealership. The run-up in new-vehicle sales is helping the average U.S. dealership return to a more normal business model after depending on fixed operations and used-vehicle sales to weather the automotive depression. Revenue from used vehicles and parts and service rose again in 2011 but accounted for smaller shares of total revenue at the average dealership because new-vehicle revenue expanded at a double-digit rate compared with 2010. 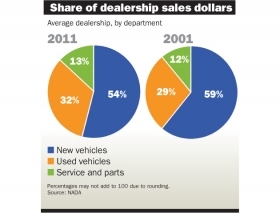 That's based on data in "NADA Data 2012," a report released June 11 by the National Automobile Dealers Association. It's the group's latest state-of-the-industry report on dealership financial trends. NADA's data show a 16 percent increase from 2010 in new-car sales revenue, to $18.9 million. That helped push total dealership sales to $34.7 million, a 12 percent jump from 2010. The average dealership's pretax profit rose 24 percent last year, to $785,855. But some dealers are reluctant to slack off on service business and used-car sales for fear the bounce in new-car sales is temporary. "We're having some smaller increase in new-car sales -- the swing from 2010 to 2011 was huge," says Morrie Wagener, owner of Morrie's Automotive Group in Long Lake, Minn. "Our used-car business is still growing but at a slower pace from last year. That's offset by the new-car volume. But I think it is economy-driven and market-driven." Wagener sells about 16,800 new and used vehicles a year. His new-car sales are up 10 to 14 percent through May compared with the year-ago period, he says. Used-car sales are up about 20 percent, he says. According to NADA's report, new-vehicle revenue at the average dealership last year rose to $18.9 million, or 54 percent of total dealership sales, from $16.4 million, or 53 percent, in 2010. Used-vehicle sales, as a percent of total sales, dipped slightly, from $11.2 million, or 32 percent of total sales, to 10.2 million, or 33 percent. The average new-vehicle selling price rose 3 percent to $30,659. The used-vehicle selling price jumped 5 percent to $17,267, the report said. Used vehicles contributed one-quarter of operating profit in 2011, down from one-third of operating profit in 2010, the report said. Service and parts sales also declined as a percentage of total sales at the average dealership, according to the report. In 2011, service and parts sales at the average dealership were $4.6 million, or 13 percent of total sales. In 2010 it was $4.3 million, but 14 percent of total sales. Fixed operations remain critical, analysts say. "There is still a need for dealership service," says Robert Schulz, managing director at Standard & Poor's in New York. Schulz says dealerships will have to continue improving their competition with independent service shops for maintenance business. Dealer Wagener agrees, saying he relies more on maintenance than warranty work. "The quality of cars is up so much," Wagener says. "It used to be 100,000 miles was the kiss of death. Now people are keeping their cars longer." Meanwhile, the economic recovery has helped dealers make more money selling finance and insurance products. In part, that's because financing is more readily available -- and more deals mean more F&I products. "Three or four years ago these bankers were all hiding in their closets. It's done a 180 here, and there's plenty of money around," says Wagener. Wagener says F&I is becoming more critical to dealer profits as margins on vehicles narrow. He says his F&I business is booming. A jump in the number of service contracts, F&I products and other products sold contributed to the average dealer's aftermarket income rising to 34 percent of new- and used-vehicle department gross profit, from 32 percent in 2010. F&I products were sold to 77 percent of new-car purchasers in 2011, up from 75 percent in 2010.